Post mortem examinations have begun on bodies exhumed by police investigating a former GP accused of murder. The men, in their 70s and 80s, were understood to be patients of Dr Howard Martin, who is awaiting trial accused of murdering a patient. Police carried out the exhumations at two separate cemeteries in south west Durham under cover of darkness. 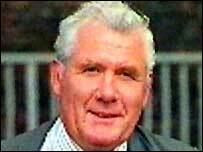 Dr Martin, 70, of Penmaenmawr, Conwy, North Wales, denies the murder of Harry Gittins, 74. He is on conditional bail. Detectives have confirmed a third body is to be exhumed as part of the ongoing murder inquiry. At around midnight on Tuesday police arrived at the two cemeteries to begin excavating the two graves. Dr Martin - who is accused of administering a fatal dose of morphine to Mr Gittins, of Newton Aycliffe, County Durham - is due to stand trial at Teesside Crown Court in March. The GP, who has surgeries in Shildon, Bishop Auckland and Newton Aycliffe, was charged with murder in August. A spokesman for Durham Police said: "The bodies were taken to the mortuary at Bishop Auckland General Hospital, where a post mortem examination was carried out by Home Office pathologist Dr Mark Egan. "A third exhumation is to be carried out at another cemetery, but we are keeping the location confidential for obvious reasons." Large frame tents covered the sites and specialist lighting was brought in to help the teams involved. 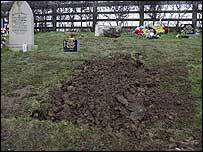 The body of Mr Gittins, who suffered from cancer, was exhumed last year. The police spokesman said the exhumations were being conducted to "attempt to establish their exact cause of death".